After much soul-searching (and perhaps a bit of insta-FOMO), I have finally not only accepted but now embraced the change in season! So long refreshing summer berry ice creams! Adios frozen smoothie bowls! 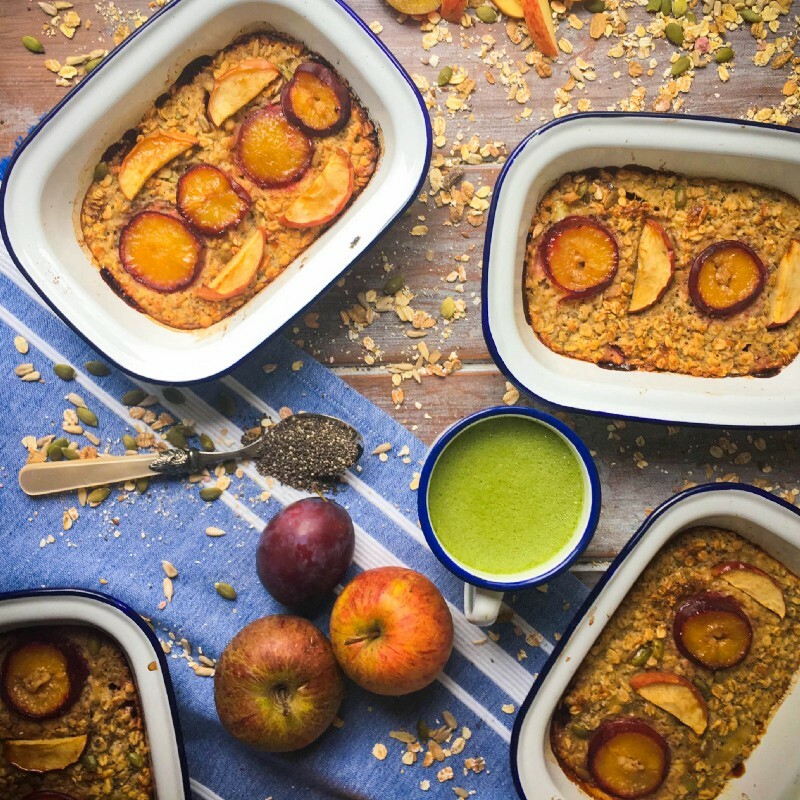 And a huge welcome to this perfect autumn warming and nourishing breakfast. Each serving provides 404 calories, 17g of protein and 10g of fibre thanks to the Omega-3 rich Chia & Flaxseeds, as well as wholegrain oats. This seemingly indulgent crumble-like breakfast is wonderful fresh out of the oven with a nice dollop of creamy yogurt, but is also equally delicious served cold to be enjoyed over the next few days. I normally make a batch on the weekends and then it serves me well as a super speedy breakfast during the week. It keeps me full all morning long thanks to the complex carbohydrates and high protein content, along with nutritionally dense and wholesome ingredients. · Grease a 22cm square baking dish. (I didn’t have mine to hand so used 6 individual enamel dishes but still worked great). · In a mixing bowl, combine the oats, protein powder, chia seeds, flaxseeds, seeds, cinnamon, baking powder and salt. · Bake for approximately 40–45 minutes if using a large dish, until the top is nice and golden. The individual enamel dishes only take 25–30 mins to cook.